my condolences for your loss. His loss is one felt by all who knew his writings and his work. Just as you knew him as an inspiration, so too did he know your potential. Your special relationship is an inspiration really. your work is amazing, and at times simply beautiful. and I have to tell you, you did manage to organize your thoughts into elegant prose. As you said to me and others, your picture can be applied to any of us who was fortunate enough to meet and know our friend. Thank you, Krishna. I have been feeling silly, foolish almost crazy when I think about what Roger Ebert meant to me – how do you explain to someone -who has never been close to true greatness -what it feels like to be touched by someone who was truly great? I feel his magic in your outpouring of expression. You will serve his legacy well Krishna. I will try to do the same. Of course, surrounding myself with work by people like Roger Ebert and Steven Spielberg has “nurtured,” as you rightly put it, my passion for the things I enjoy doing. Roger was indeed overwhelming encouraging, and is half the reason I’m here, making art. I hope I can serve his legacy well. I also hope you join me. I didn’t know him, but that picture encapsulates beautifully the way I always felt it would be if I had. Thank you. Krishna, thank you for sharing this with us. We all feel as if we have lost a great teacher and your picture describes what his writings meant to us, how he taught so much about the world and movies from his writings. It’s only the tragic circumstances of Roger Ebert’s death that made me find your blog. You are certainly a person whose thoughts I want to follow: whatever the form of articulation, this is a woderful blog. For sure I am not the only one who feels this way. Roger Ebert knew that, of course. Having to confront thoughts of death, he once called evolution “that most consoling of all the sciences”. And he certainly knew why: as tragic as his death might be, at the end of the day there is nothing to worry if people like you are around, making somebody else’s lives a bit richer, a bit happier! Your cartoon is wonderful, in a way it reminded me of Antoine de Saint-Exupéry’s illustrations to his “Le Petit Prince”. Did you see the know rogerebert site, by the way? It looks phantastic! Martin, thank you so much for your very kind words. You’ve just about made me day. Roger’s life was such that he was repeatedly brought close to death time and again, and so he had done a lot of thinking (and hence writing) about the topic. I find such comfort in his thoughts about death, Martin. It makes the idea of death a little less formidable. “I know it is coming, and I do not fear it,” he wrote, “because I believe there is nothing on the other side of death to fear.” And you knew Roger wasn’t lying or simply consoling his readers or himself, just to make death sound less depressing or something; he was just saying what he thought was the truth. He was an honest man. I don’t know if I’m making much sense. The point is, I appreciate that Roger shared his thoughts on a great deal of things beyond movies. And we’re all the better for it. Anyway, YES! I have seen the new version of RogerEbert.com, and it’s so, so beautiful. And functional. And everything I had ever wanted it to be and more. It’s brilliant, really. Thanks for your answer, and yes, it does make sense. It is present in all his writing, especially in his movie reviews, too. I think, and this is just my very personal impression, that he was never caught in the intellectual trap that one can somehow abstract away one’s opinion from one’s personal point of view. As a reader, I never had the impression to read a final judgment (as with so many other reviewers), but a mere starting point for further thinking. He provided an entry point by telling you his experience, where others would just try to convince you of their opinions. And I believe this also played an important role in the establishment of the far-flung correspondents’ family: how a movie is perceived with regard to one’s background is a very valuable information, if done sincerely. And the establishing many point of views means extracting the many truths contained in a piece of art. Against this background, I still find it jawdropping what he achieved so late in his life! I guess most people, especially after what he had already gone through at this point in his life, would simply have gone into their – richly deserved – retirement. Instead he launched a review revolution taking account of the power of social media and the global interconnections they allow – something collegues decades younger did not understand as early as he did! He launched this project that, standing alone, would be a lifetime’s achievement! And I hope so so much that it succeeds, not just in the narrow sense, but in changing how we talk about movies, and perhaps art, in general. It is sort of tragic that he didn’t see the launch of it. I also think, and Roger said it often enough, that Chaz deserves a lot of credit as a major driving force in terms of organisation and motivation behind all of it! Five years ago, could I have imagined to read reviews of a Brasilian movie critic? To admire a blog of one Krishna Bala Shenoi from India? What reason would I have had to even look out for something the like? Now I know, and I wouldn’t have without Roger Ebert, and for this he deserves a big, heart-felt Thank You! You say you wish that Roger Ebert’s project succeeds. Know that your “lengthy comment,” and all that it says, is a great testament to the success of his project, beyond the narrow sense. Your thoughts on the correspondents and Roger’s initiatives in general are very kind and also almost completely in line with my point of view. Only, you’re a little more optimistic about the Far-Flungers than I am, and I thank you so much for that. Roger just wanted there to be a larger, more expansive sharing of ideas. We’re getting there. And you said something that I’ve always known, but never *really known*… that I went to Roger’s reviews for a starting point and not a final judgement. I find my reviews take that form increasingly these days. That’s why, I think, he found not much meaning in thumbs and stars. I don’t even know you, but… What you’ve written, the way you’ve let your soul speak, it has left me in tears. Maybe because your pain is piercing and the support you were blessed with… I never got that sort of support. And when you’re into art and aspire to make movies, it’s one thing you need more than a budget or a script. Roger must be very proud of you. What a great gift Roger bestowed on you, but you also gave him great joy as well. I hope enough time as passed that let’s you realize you will have the opportunity to share stories with Roger again. Well written. And the cartoon is perfect. Perfect. How many young men will you end up being ‘like a father’ to? I’m sure you will. I hope to one day treat people the way Roger treated me. 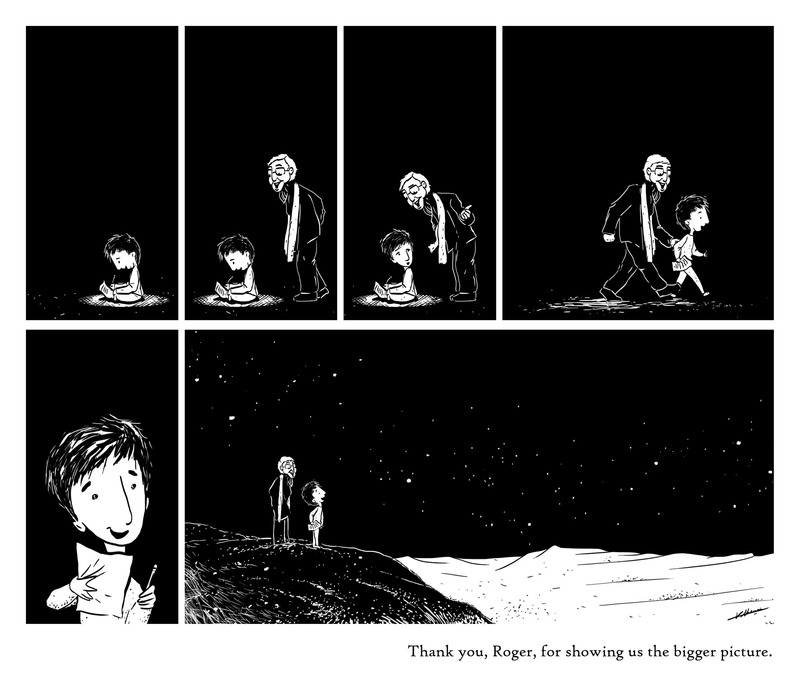 Thank you Roger has a meaning to me. My best friend and soul mate who passed named Roger. I love Roger Ebert as well. Namaste. And I suppose, Sarfaraz, that you happened to know, in detail, just HOW Krishna first met Ebert? Try finding out, you may be surprised. That was sarcasm. You clearly have no idea. You will be surprised.